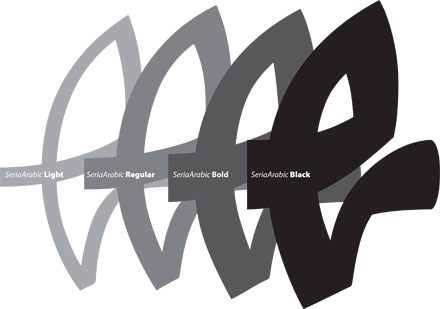 Above: From Pascal Zoghbi’s own posting on his exciting new release with FontFont. Pascal’s FF Seria Arabic is based on FF Seria by Martin Major, and has a lovely choppy flavor especially at the heavier weight. The new font is based on a collaboration between both designers from the Khatt Foundation’s recent Typographic Matchmaking project, 2.0. To see a full character set, look for the PDF preview, FontFont is working on issues with it’s non-Latin based character display system. This problem actually provides the perfect argument for creating more solutions for this issue on a global scale. Pascal Zoghbi / FF Seria Arabic: FontFont’s first Arabic release. This entry was posted by Erik Brandt on Wednesday, June 10th, 2009 at 9:22 AM	and is filed under Aktuell, Education, Geotypografika, Globalization, Graphic Design, International, News Links, Typografika, Typography.